Mabo Matati Mununggurritj joined the Marrma’ Rom – Two Worlds Foundation for orientation in the last part of Term 4, 2013, to get a taste of what life was like down here in Geelong. He arrived just as the weather turned cold and wet and left 4 weeks later when the weather returned to temperatures he was more used to. The four weeks he spent down here were extremely busy and very different to life up in Yirrkala and Garrthalala his homeland where he spends most of his time. Mabo was very quiet in the beginning, as are all the boys when they first arrive, but by the end of the four week orientation he had really opened up. Mabo was certainly not shy when it came to performing on stage, joining ‘Yirrmal and the Yolngu Boys’ and Shane Howard only days after he had set foot in Geelong. Mabo is a very talented didj player, singer and dancer. He was also a very handy footballer making a great contribution to the Newtown U/18 football team. Mabo made the most of his time here in Geelong however at the end of Term 3 he made the decision to return to his community. His grandmother was very sick at the time and he wanted to be close to his family. We enjoyed having him as part of the program and wish him well in the future. 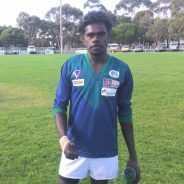 Mabo is still playing great footy and we believe he is working back in Yirrkala, which is a great result. Taris was also from the community Galiwinku’ or Elcho Island. Taris was a very quiet student and it was an extremely big step moving away from his very supportive family. Taris entered the program at the beginning of 2015. 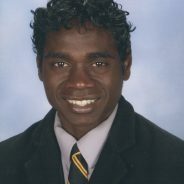 It was a little tough for Taris as he was Year 11 on his own, with the two younger lads in Year 10 and Raven in Year 12. Taris found it hard being away from his family and for this reason decided to only stay for half a year. During his short time here he achieved a lot, mostly on the stage with Yirrmal and the Yolngu Boys. A very talented musician, we saw Taris on guitar, bass, percussion and back up vocals. The band were certainly the best they have been with Taris joining them. Taris went back to school in Galiwinku’ and we hope that he has set himself some big goals in life as he has a lot of potential. We wish him well. 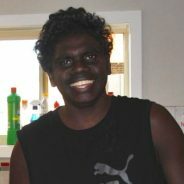 Raven became a participant in the Marrma’ Rom Foundation program in 2012 and stayed for 3 terms before deciding that he wanted to return to his home community of Galiwinku’. At the end of 2013 Raven contacted Cam and Melissa and asked if he could return as he felt he missed a great opportunity. The decision was made that he could return for the start of the 2014 school year. Raven entered at Year 11 and returned in 2015 to begin the journey towards graduating from Year 12. Unfortunately, Raven was only weeks away from graduating but did not return after the Garma festival. Sadly he had some funeral ceremonies to attend and he felt the pressure from family to stay for those important occasions. During Raven’s time here he played some amazing football with the U/18 and Reserves Newtown football team and was also part of the St. Joseph’s school football team which won the school competition – a fantastic effort and achievement to be part of this team. We hope that Raven can make some good decisions in regards to his future and hope that he lives a happy and healthy life. He certainly learnt a lot whilst being part of the Marrma’ Rom Two Worlds Foundation. The growth that was witnessed by Cam, Melissa, teachers and footy coaches was commendable. Nonngunu was another of the first students to commence the program. Nonngunu travelled to Geelong with the other 3 lads however there was always a different pathway for Nonngunu. It was intended that he wouldn’t attend St. Joseph’s College but instead undertake a work placement as a Ranger and enrol in a basic English and maths course. The goals for him were to improve his literacy and numeracy skills whilst working and learning skills out in the workforce. Nonngunu was doing well although the pressures from home pulling him back were too strong and he succumbed and made the decision to return to Yirrkala. He spent 3 good months down here and learnt some important life skills that we hope will benefit him in the future. Marradukthun commenced the program at it’s inception in April 2011 and he was one of the first four students. Marradukthun, also known as Muzza, found aspects of the program difficult but excelled in other areas. He was an outstanding footballer player and it was always good to watch him play a game on a Saturday for St. Mary’s. 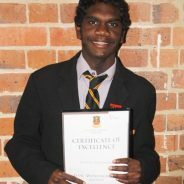 Muzza completed Year 11 alongside Yirrmal and then made the decision to return to Yirrkala. He attended school the following year for a short period but then decided to seek work. Muzza is still in Yirrkala playing football for Djarrak and this year was part of the premiership team. We wish Muzza a happy and healthy future. Dimathaya commenced the program at the very beginning in April 2011. He was one of the first four students to be part of the Marrma’ Rom Two Worlds Foundation. Dimathaya displayed great potential at school and did very well in his English classes. Dimathaya previously did attend St. John’s College in Darwin so being away from home was not new to him. Unfortunately for him he damaged his knee quite badly playing in a game of football for St. Mary’s. After some intensive physio and appointments at the hospital to try to plan a knee reconstruction, Dimathaya decided to go back to Yirrkala. It was a disappointing end for him and for his family as they had been really keen for him to complete his education in Geelong. Dimathaya returned to his community towards the end of 2011 and is now working. He is still playing music with some other lads from Yirrkala and they have formed a band ‘Easy Five’. He has also since become a father. We wish Dima and his family all the best for the future. 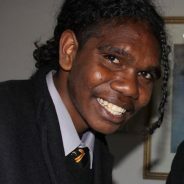 The Marrma’ Rom Two Worlds Foundation welcomed Alviston Wunungmurra to the program in early November 2015. Alviston, aka Alvo, is 17 years old and from the same community as Jazariah – Gapuwiyak. Alvo is very close family with Isaac (a past member), in fact in their culture he calls Isaac ‘Dad’ and he also calls Cam ‘Dad’ which is a really nice relationship to have in the house. Alviston enjoys basketball and joined the Rovers team in 2016. In term 2, 2017 Alviston changed schools and started attending the Flexible Learning Centre – St. Joseph’s, which is located in central Geelong. He made a great start there and it is his goal to continue his education at this campus. 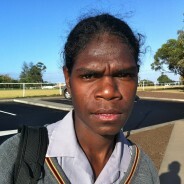 Jazariah is 18, from Gapuwiyak, and has been a strong leader in the Marrma’ Rom program. Jazariah made a really positive start to the program and displayed his commitment by declaring he wanted to stay here and graduate in Year 12. If Jazariah remains focused and committed to this goal, then he will graduate in November 2017. Jazariah plays football in the U/18 Newtown team and is a valued player each week, usually kicking a goal or two. Although it doesn’t happen often enough, Jazariah does sometimes join Yirrmal on stage dancing and playing the clapsticks. Jazariah was elected the Aboriginal and Torres Strait Islander (ATSI) Deputy Captain for the 2016 school year. A great opportunity for him to display his leadership traits. We welcomed Isaac to Geelong at the start of 2015. Isaac is the youngest student we have had in Marrma’ Rom Two Worlds Foundation at 14 years of age. Usually we don’t take in students until they are 15 or 16 but Isaac was really keen to come down and his mum wanted him to be part of the program. Isaac is doing really well at school, at home and with all other aspects of the program. He has made new friends at school and according to his teachers he is working really hard in class. 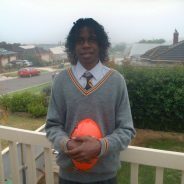 Isaac played in the U/16 Newtown football team and was chosen to be part of the Multi-cultural regional football team. Isaac barracks for Collingwood and has loved going to the MCG to watch the footy. 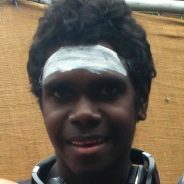 Isaac has performed with Yirrmal and the Yolngu Boys as a dancer and played percussion and clapsticks. He is learning keyboard at school. Isaac was elected to be a Fire Carrier for the 2016 school year. Congratulations Isaac, we are all very proud of you. Seviro joined the Foundation in 2013. He entered the program at Year 11 at St. Joseph’s College and was in the same classes as Dion and Jerol. Seviro was another student from Gapuwiyak, and he is pictured here with his father Harry and mother Katherine at the Gapuwiyak CEC Community Education Centre. Harry and Katherine both work at the school. During his time here Seviro enjoyed playing football and was a budding musician, so he was well suited to our program. Seviro completed 3 terms of Year 11 and then decided to go back to Gapuwiyak; he found it very difficult to be away from his family. 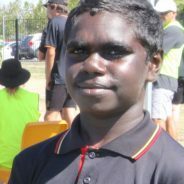 We were very pleased that he finished Year 11 at Gapuwiyak in 2013, continued on to complete Year 12 and graduate and is now working in the community. Cam travelled up to the Gapuwiyak CEC to attend his Graduation ceremony. Dion was a student from Gapuwiyak, or Lake Evella. Dion joined the program in 2012, beginning his educational journey in Year 10. He was an organised and motivated student and these characteristics allowed him to commit to 3 years and graduate from Year 12 in 2014. A fantastic accomplishment. Dion was an accomplished didgeridoo player, and has a vast knowledge of traditional ceremonial ‘manikay’ music. His father is a singer for the Dhalwangu clan. Dion took front stage as a dancer in the band, ‘Yirrmal and the Yolngu Boys’, and also sang vocals and played didj. Yirrmal certainly misses him in the band. 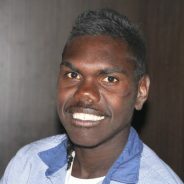 Jerol Wunungmurra joined us in Geelong at the start of Term 2, 2012. Jerol was from Gapuwiyak (Lake Evella) – a small community about 200 km east of Nhulunbuy. 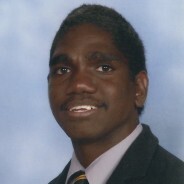 Jerol entered Year 10 at St. Joseph’s College. Jerol loves his footy, and played in the U/16’s and U/18’s at St. Mary’s Football Club. He is strong in traditional culture, being an up-and-coming didgeridoo player and singer of Ceremonial ‘Manikay’ songs. Jerol completed his work experience with David MacDonald Construction, where he impressed the builders with his work ethic, diligence and solid character. Jerol was a sensible and mature lad and totally immersed himself into the Leadership Program. His spoken English skills improved significatnly, as did his confidence. When the boys performed at the Cats’ Supporters Club pre-game function before the round 15 Cats v Pies AFL game, Jerol took the microphone and role of ‘Manikay’ Ceremonial Song singer, whilst Yirrmal played the didgeridoo. It was an impressive debut by Jerol, considering he had never performed with a microphone before, and a sign of great things to come. Jerol graduated alongside Dion at the end of 2014 which was a fantastic achievement. His father flew down for the occasion and was a very proud parent, as were Cam and Melissa. Jerol decided to return in 2015 to continue his studies. He was enrolled in a Certificate 3 in Aboriginal and Torres Strait Islander Primary Health Care at VACCHO in Melbourne and was also attending Gordon Tafe on a Friday completing a bridging course in English and Maths. Although Jerol was going really well – he was enjoying his course and was renting a house with Yirrmal – he decided that he wanted to return to his community. It was sad to see Jerol go but he had spent a little over 3 years in Geelong and we were very proud of his efforts. Jerol is currently working in Yirrkala. We wish him well for the future.